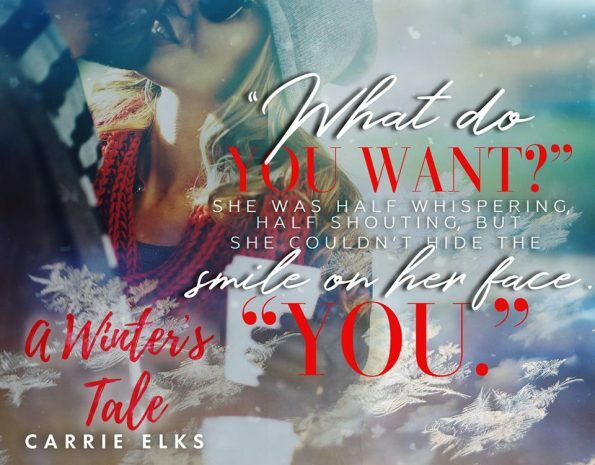 Review – A Winter’s Tale by Carrie Elks – 5 Heart Warming and Magical Stars! 5 Heart Warming and Magical Stars! When Kitty was given the job of being nanny, to a big producer’s son, she decided she had nothing to lose. What she hadn’t planned on was falling in love with the brooding man living in the cabin. Will true love prevail? Or will secrets and lies, from the past, come between their happiness? Another fabulous, beautiful, and enthralling romantic read from Carrie Elks. This second book in the Shakespeare Sisters series did not disappoint. Kitty and Adam’s story is a fun, heart-warming, Christmas story. Whilst reading this story, I’m pretty sure I wore a huge smile on my face, for most of the time. It was hard not to get swept up into the fun they had together and the obvious attraction they shared. Once they tore down the walls they had put up, they brought out the best in each other, they brought life back into their lives and lived for each day. This sweet festive story had characters I loved, some I disliked, and some I wanted to throttle. One character, in particular, was really sweet, and very wise for their young age; considering the atmosphere around them, they still found the interest, and the energy to enjoy the festivities around them, and their little heart held so much love for everyone. I truly enjoyed this second book in the Shakespeare Series. If you enjoy contemporary, comedy romance stories, A Winter’s Take is for you.